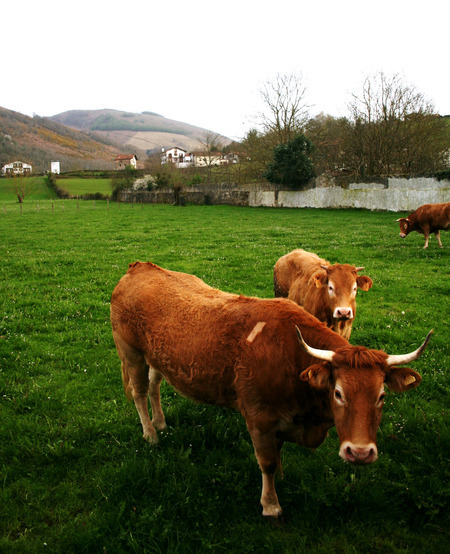 The longer I live in Basque Country, the more I realize that for every discovered secret, there are one hundred more. For every amazing pintxo, there are dozens I've never tried. For every incredible view you stumble upon, there's always one waiting to be seen. And, doing research for an article on the cerdo vasco/Euskal txerria/Basque pig, I found that the same tenet applies in the porcine world. This is a story of disappearing pigs. The cerdo baztanés, or the Baztán pig, is thought to have originated on the farm of the San Francisco Javier Psychiatric Hospital. It was a mix of the local, primitive Basque pig and some foreign races brought in to increase productivity, including Yorkshire, Alderney, and Craones. Characterized by its wide forehead, snout that juts at an obtuse angle, and big, floppy ears, its skin was light and covered in bristly hair. This rustic race had a short neck, arched back, and a "drooping ham". The valle of Baztán is a spot of incredible beauty, located about 30 miles north of Pamplona in the very Northern tip of Navarra. It is a magical place, purported to be one of the possible origins of the Basque language, with a history full of witchcraft and wilderness. Until the end of the 1960s, almost all the pigs in this region were Baztán pigs. They were raised for 8-10 months, fed intensively on potatoes, corn, barley, and boiled beet. The weight of a fattened Baztán pig was about 180 kg. The yield of the pigs fattened like this was very high, which in part contributed to their fame. In the weekly market of the town of Irurzun, 68,900 suckling pigs alone were sold in 1956. All of them came from the relatively tiny area including Baztán, Regata del Bidasoa, Larráun, Araiz, Araquil, Burunda, Ollo, Gulina, Basaburúa, Imoz, Ulzama, Odieta, Cendeas de Iza y Ansoáin, Leiza, Areso, Ezcurra and Eraso. The industrialization of the 65,000 Navarran pig farms really only began in the 1960s and 70s. In addition to technological advances and changes in the structure of farms, the crossing of races was introduced by local government to help with conversion and growth rates. The Blanca Belga was crossed with local breeds, and this is what ultimately caused the extinction of the local Baztanesa. The Chato Vitoriano is another race that died out (famed for its excellent and abundant fat), leaving us with one local pig breed, the Euskal Txerri. In 1989 there were 25 in existence, but thanks to local efforts the numbers are up and this Basque pig looks like it's around to stay.